Our day began as planned. Because my cough was triggered by deep breathing, I decided to walk extra-slowly today, in hopes of keeping my lungs under control. Thus, I chose to leave an hour earlier than standard departure (2:30 AM instead of 3:30 AM). This may not sound like a big difference, but we are always racing the sunshine up here. In the Khumbu Icefall, sun is not necessarily a safety issue, like it can be on many snow-covered slopes that may avalanche in the heat of day. The forces in the icefall here seem to transcend the temperature swings of day and night… the icefall is massive, and always on the move. Rather, sunshine brings heat that makes moving miserable. 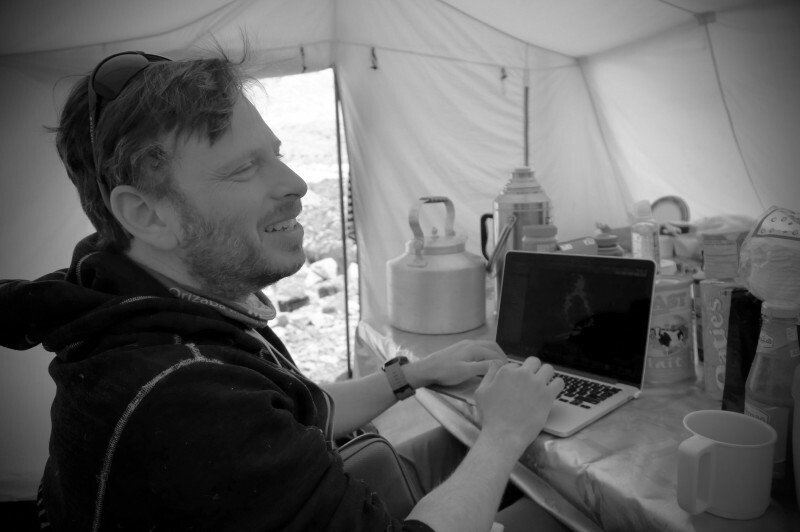 We always reach Camp 1 in daytime, but hope to be out of the icefall before the sun hits. Last time we managed this perfectly… could I do it again with gimpy lungs? Hopefully the extra hour would make this possible. Leaving for a 5-day rotation involves quite a bit of preparation. Not only does the gear load need to be perfect, but also the tent must be left in some semblance of order. Returning to a festering, chaotic tent after some days away is just not acceptable. Thus, I spent most of yesterday getting things in order, at a leisurely pace. Our tents are two-person mountaineering tents made by Eureka. As always, perfectly fine for one person’s base of operations on this expedition. I have lined the tent floor with a small woven carpet, purchased at Namche Bazar, in order to help keep the cold of the moraine from creeping up into the living chamber—thanks for this idea Emily Johnston! There’s room inside for my sleeping pads (I sleep on three of them) plus sleeping bags (I sleep in two of them) plus one of my duffel bags (the other is secured in the tiny rear vestibule). In this configuration, I still have room for a “bare” carpeted area, perhaps 2 x 4 feet. This is my “living” area and staging zone for getting organized. And, usually, it’s covered with random stuff that should be in the duffel. Pack, boots, and climbing hardware live in the more capacious front vestibule. When I am away, everything goes into the tent, and the doors are secured. Except my laptop, which goes up the hill to the HQ tent. Theft here seems almost inconceivable, for a variety of reasons—I have never seen or heard of anyone coming into IMG camp from outside—but this is a simple precaution to take. So, housecleaning takes a bit of time, here as at home. Smart wool PhD ski socks with shin padding, worn inside out. Snacks for the push to Camp 1 (more food awaits there): 2 packs SportBeans, 3 snickers, M&M’s, peanut M&M’s, pomegranate Honey Stingers, Justin’s Nut Butter (honey + almond). GoPro 4Black in hard case, modified for use with auxiliary battery, three GP batteries, with two empty 64GB SanDisk Extreme Pro cards. Sony alpha 5100 camera with two batteries, plenty of room on a 128GB card. Carrying small kit e-mount lens on this run instead of 50-200mm Tamron after-market lens. La Sportiva Olympus Mons boots, size 47, modified by Dave Page to accommodate my old shin injury. Petzl Vasak 12-point crampons, lever lock, with long linker bars. BD Raven Pro 70cm axe with leash. 1/2 inch tubular nylon webbing sling. Again, the only way we can get up there with such tiny loads is because of all the hard work of our Sherpa partners stockpiling supplies up high. Anyhow, all this is packed and ready to go by the time we sit for a short breakfast. Last minute fiddling and synchronizing of devices, and we’re off. A minute from the dining tent we arrived at the puja stupa. Juniper boughs were lit, and dried rice tossed onto the altar, and we asked Miolangsangma for permission to climb the mountain. 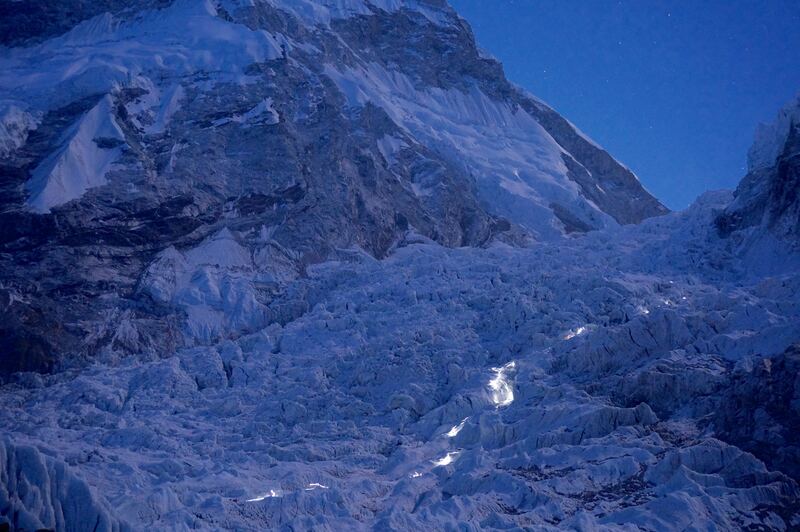 A very large avalanche released from Nuptse near the icefall at that moment. In the icefall, in the distance, we could see headlamps swing rapidly from side to side as those on the route looked quickly for the coming blast… nothing was evident from our position, and we assumed that the route was clear. No radio chatter to suggest the opposite. We proceeded with the ascent. And then something amazing happened: I felt great. Going into today, I have felt pretty awful. Not just tired, but wracked with coughing fits productive of a great variety of sputa. One of my favorite games is to name the material that I expectorate in relation to varieties of sea life. “I just coughed up a Kumamoto Oyster. There goes a Penn Cove Mussel. Oooooh, a red sea cucumber!” Once I coughed so violently that I injured one of the muscles in my ribcage, leaving me vulnerable to really severe pain with subsequent coughing fits, or even rolling over in bed. Several days ago I truly doubted whether I would have a legitimate shot at the next rotation, much less the summit. Today, I felt great. Just a few coughing spells, which were tiny and non-productive. The chest pain was almost negligible, even though it had been crippling in my sleeping bag a few hours earlier. My sinuses still fill with cold mucus right away, necessitating frequent positive pressure maneuvers (i.e. snot shots), but that is no big deal. I simply could not believe how good I felt on the move—so much easier this time, so much power in my rubber-band-thin quads, almost never feeling as though I might run out of breath. This is because of the guidance and support I have gotten from Justin and Emily, because of the miracles of modern medicine, because of the deliberate pace Justin set today… and also because of the weather. The air was warm and still, with none of the withering cold wind that has hounded us daily here at EBC. We heard the forecast yesterday, that the jet stream was going to leave Nepal entirely, which is very unusual. It felt like a miracle to me… not even the typical katabatic winds that we expect every morning. Just still, crisp air with a hint of forest fire smoke from down-valley. We made it to the base of the fixed lines in about an hour. And then came the news via radio: Part of the far wall in the Pit of Despair had collapsed, and the route needed to be reestablished. No injuries, and there were climbers both above and below that spot. Whether this was related to the avvy we heard at the altar is not clear to me at this time; it was clear right away to our leadership that it would be hours before the route was fixed. No question: Time to spin and head for home. I was not angry or even disappointed. It is what it is. This morning had been a success: I had proven to myself that I could head up the mountain without doubling over in coughing fits. I can give it a shot again. Because IMG’s communications infrastructure is unsurpassed on the mountain, we heard about the collapse right away, before most everyone else on the way up. We did our best to spread the word to other groups as we walked home, and eventually everyone above us turned back as well. From near crampon point, Justin and Pasang Kami and I stopped to shoot some photos, which I think are amazing and show the lower route pretty well. Dawn arrived, touching the top of Pumori and turning it peach colored. The air remained warm. Down the glacier, occasional pops and groans echoed, as the ice made its slow, majestic way down valley. It was the first time I have taken a moment to appreciate—truly appreciate—the beauty here. It’s just a mountain. And it’s beautiful. We can do this. Home quickly, back to bed… and now I need to get the organizational aspects back in order. Today was a gift—I suppose every day is one—and tonight we will get our game faces on. Thanks for writing as often as possible so that I know that you are still following, or should I say tackling, your dream. Black and white picture of you at your computer, so wonderful, and so you! Going to forward this to some of my geography/social studies colleagues plus your namesake, Stuart Paul’s girlfriend, Michelle. She, too, is a teacher and I feel they will all benefit from reading your blogs and seeing the magnificent pictures. Continues prayers, thoughts and love as you get ready for a new day and tomorrow – you BD! Do you get room service? I’m an acquaintance of Caryn Hess whose son and daughter are presently getting to know Everest. I asked to be included in receiving what was coming off the mountain in terms of the written word and photos and I hit the jackpot. Thank you so much in sharing so eloquently and clearly an experience I am eager to share vicariously, just being someone who loves snow and skiing and mountains and exploration of trust, faith, courage and risk-taking. For us in the relative flatlands, having this facsimile of your climbing experience does something for us, as do the 2-D photos. The stairs to the next floor, or an easy walk up a mild slope, is probably the physical climbing extreme for most of us. Piggy-backing up and down Everest feels like a spiritual climb for all of us. Thanks Carol, appreciate your interest! So happy to hear that you are feeling better. Thank you for these wonderful posts which let us experience this with you. The photos are stunning. Great to hear from you Kelly, thanks for following and for your encouragement! I think it might be April 30 where you are. Happy birthday!! Wish I was there to share your cake. I am still fighting my cough. Stay healthy. Thanks much, and take care of yourself too! Get that checked out, seems too long for Khumbu to linger…. Great shots – love the one of you writing. Stay healthy! Glad to hear you are feeling better. I love the black and white photo of you. Stay well and safe, which I know you will. It’s wonderful to know how you are doing. Thanks Alison! Hope all is under control back home! So relieved and happy to hear that your cough is better. I’m sending you love and prayers and wishes for a healthy, happy birthday in EBC. What the hell do you need the tadalifil for? Reduces pulmonary artery pressure, thus cuts risk of high altitude pulmonary edema. Strong recommendation by WMS guidelines for rapid ascents, not adequately studied above 7000 meters…. rational, and well tolerated by me (no hypotension). Hey Paul, happy birthday, old man! We’re all pulling for you here in Seattle and sending good weather and climbing vibes your way. We miss you. Thank you SO MUCH, I appreciate all the support and good wishes! Happy birthday, Paul! I hope you are using your meds to reduce your pulmonary vascular resistance and that your cough clears. Take care and best wishes for a fun adventure. Yeah, listen to Julie telling you to listen to Dave! Sending love and hugs. Thanks again Dave. No nifedipine or tadalafil yet… this seemed to be upper airway irritation rather than true distal airway congestion. BUT, I do have those meds at the ready if there’s concern for HAPE. Will probably take low dose tadalafil starting at 7500 meters…. will report again soon! I appreciate your detailed reportage enormously. It’s important. And it’s well-written. Nothing “brings it home” for us quite as poignantly as a real list of real stuff, and a real recital of “hic et nunc” challenges, like breathing, sleeping, phlegm, oddly ominous moments, sounds heard, thoughts thunk, and doubts debated in the echoing theater of the mind. What you are writing puts us all right there, right in the moment, as if we were right there with you. In a very real sense, of course, we are. Remember that! And keep writing whatever you can, whenever you can. It’s valuable, and very much appreciated, as are your superb photos. 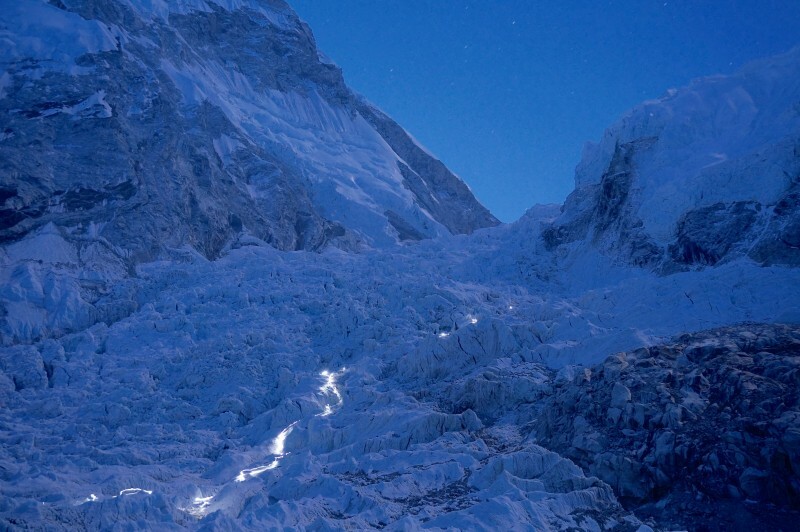 I’ll bid a fine art auction price for a print of one of your photos of the icefall by moonlight and headtorch light. Exquisite! Bravissimo! Such high praise, serves as an inspiration, thank you! Happy birthday Paul, glad you are feeling better! I’m enjoying following along your journey vicariously, keep up the great posts and photos. I’m amazed that you have the energy! Energy? Me too… do I have the energy? Let’s find out…. Adore you Marci, eager to see you soon. Back at ya sis! Love you. Happy Birthday, Paul! The photos are amazing. Stay healthy! Thanks Rupali, you are the best. Hope things are “under control” at UWMC. Take care of yourself, I think of you all the time. Never say never… but yes, on the mend! Love you bro. Awesome Patti, glad to have you aboard! Happy Birthday to you, Happy Birthday to you, Happy Birthday to you Dr. P2… Happy Birthday to you. So nice to hear you are feeling better. Thanks so much Josette, you are the best! Miss you guys. Happy belated birthday P2. Glad to hear the cough is getting better. Beautiful images on this latest blod – certainly one for your wall on your return. Happy belated birthday, Paul! Stay well & safe. Thanks Adrienne, you are the best! Hope work is going fine….. Thanks Wes! Yes, a week later things are much better to be sure. Appreciate you checking in… hope all is OK at home! Happy birthday Paul and lots of luck in the coming days! You are truly an inspiration! I’ve really enjoyed reading about your adventures. Oliver and his classmates here… we just viewed your blog and we loved it! Here are a few wishes from my class. Happy Birthday! Your packing list is impressive and instructive, and the photos are amazing. Thanks Tom! I’m just trying to get in shape so I can run like you do. Maybe some day….. Very happy you got this extra day of rest. Really nice photos of the headlamp trail across the moonlit icefall. You are definitely sending back some Everest images i haven’t seen before. Cool! My buddy and guide Justin shot those cool photos, I agree they are unique! Thanks so much Dad. Lots of training and prep… and lots of help from our guides and staff–best on earth–and from the weather itself. Love you, eager to catch up in person soon.